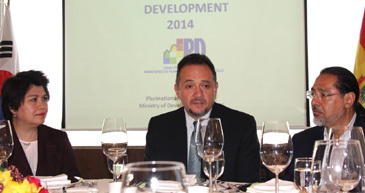 Bolivian Minister Rene Gonzalo Orellana Halkyer (center) of Ministry of Development Planning meets with local journalists at the press luncheon held at Lotte Hotel in downtown Seoul on March 26, 2015. At right is Executive Director Luis Hernando Larrazabal Cordova of Inter-American Development Bank, and at left is Bolivian Ambassador to S. Korea Guadalupe Palomeque De Taboada. Bolivian Minister Rene Gonzalo Orellana Halkyer of its Ministry of Development Planning is currently here in Seoul as head of the economic delegation to promote the Lantin Amercian nation and to strengthen ties in economic, trade, tourism, and other areas with South Korea. The Bolivian delegation includes such other key officials as Mr. Luis Hernando Larrazabal Cordova, executive director of Inter-American Development Bank, and Ms. Stephanie Bellot Kalteis, head of Operational External Finance Unit in Bolivia. At 12:30 p.m on March 26, 2015, Minister Halkyer, who holds a PhD degree, hosted a luncheon gathering with the local journalists from such media as Chosun Biz, Korea Economic Daily, Yonhap News, and The Seoul Times. The gathering with the local journalists was arranged by Bolivian Ambassador Guadalupe Palomeque De Taboada. She also attended the media gathering. 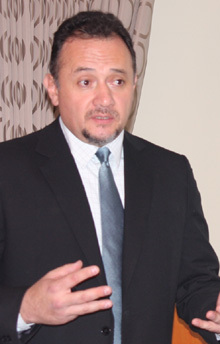 Bolivian Minister Rene Gonzalo Orellana Halkyer of Ministry of Development Planning is making a presentation on the economic situation of Bolivia in front of the local journalists at press luncheon held at Lotte Hotel in downtown Seoul on March 26, 2015. At the press conference Dr. Halkyer made a short but detailed presentation of his country's economic situation and its recent economic development. During his presentation the minister emphasized Bolivia's economic cooperation with South Korea. He said that the economic cooperation with South Korea is crucial in Bolivia's economic development as Seoul could play the role model for the South American nation. He touched upon the significance of economic assistance through such organizations as KOICA (Korea International Cooperation Agency), South Korea's governmental economic assistance cooperation organization dedicated to helping the developing countries. The minister pointed out that Bolivia has achieved an average of over 5-6 percent economic growth rate in recent years in spite of the governmental debt and other difficulties. Minister Halkyer and delegation members arrived in Seoul from Bolivia on March 25, 2015, and will leave South Korea on April 1, 2015. He said that this is his second visit to South Korea as he came to Seoul for the first time last year. During the week-long visit to the nation the Bolivian minister will meet with various South Korean government officials and business leaders to boost overall bilateral ties with South Korea particularly in economic and trade areas. The minister said that auto parts from Kia Motors and IT technology are among the hot important items from South Korea. As being a nation full of natural resources Bolivia's main export items are oil and natural gas. But the minister put the stress on such agricultural products as coffee and wine brands as its export items. Around the end of the press gathering Dr. Halkyer also mentioned the upcoming 50th anniversary of diplomatic establishment between Plurinational State of Bolivia and Republic of Korea. Bolivia set up official ties with South Korea on April 25, 1965. On the occasion of the 50th anniversary of mutual ties the two nations are preparing for a variety of cultural events in each other's nation.